Let's talk temples, palaces and temple-palaces (or actually, let's mostly look at pictures of those things). 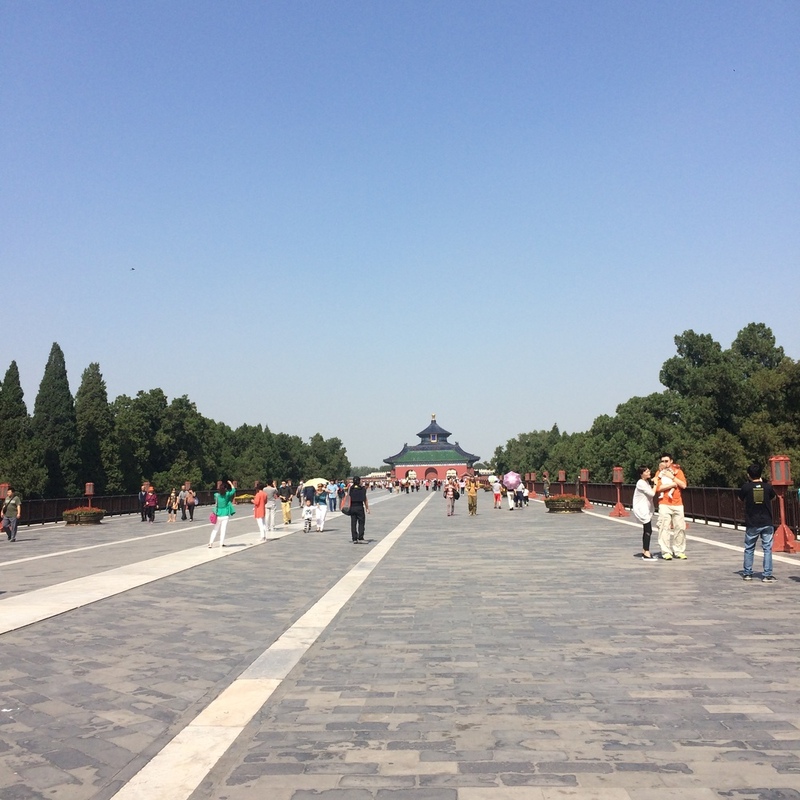 Of course, there are more than three major sights to explore in Beijing but with only four days and not liking to feel rushed while we're traveling, The Forbidden City, The Temple of Heaven and The Summer Palace are where we spent our time in between meals. Our first day in Beijing was by the far the worst in terms of weather and air quality so I'm not sure any of my pictures of The Forbidden City really do it justice. 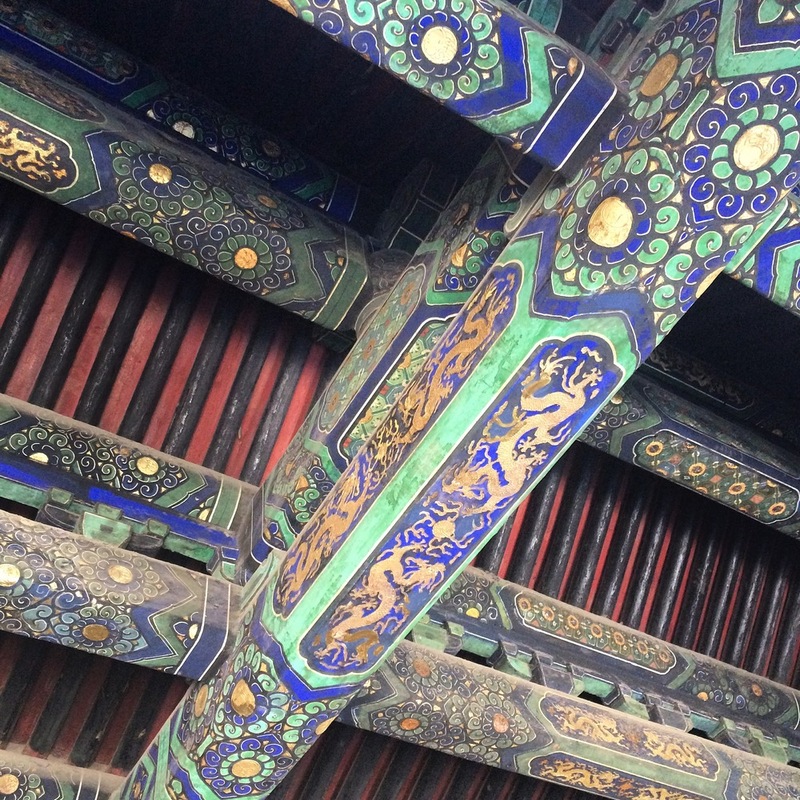 The Forbidden City is HUGE and sure, the sheer size is impressive but my focus was on the details. The animals on the roofs, the door knobs, the carvings, the CEILINGS... Even though it seemed like many of the exhibits were closed while we were there, we still had plenty to see just exploring the palace grounds. I was especially enamored of the giant metal basins all over the palace that were used to hold water in case of a fire. Everyone else also must have been because even though almost all of them were fenced off, I kept seeing Chinese tourists climb over to touch them and peer inside! Maybe, like me, they were wondering how many fireman it could possibly take to lift a basin that large filled with water. After a few hours exploring (and an ice cream break) we went out the North exit and crossed the street to Jingshan Park and climbed the hill built from the ground that was excavated to make the Forbidden City's moat. It was truly awesome to see the size of The Forbidden City from above, though I'm sure the view would have been even better on a clear day. Our third day in Beijing we lucked out with a clear sunny day and spent the morning exploring the Temple of Heaven Park. Dan was less than impressed with the two temple mounds, in part because all the signage seemed to worded in a way that focused more on the glory and ingenuity of China and how it should make you feel, rather than on an explanation of what anything was. We have no idea if the echo wall works since it was mostly being used by screaming children who didn't really need the wall to assist them with being heard. Also, there is no shade at all immediately around the mounds, and we forgot sunscreen or hats. Womp womp. That being said, I once again found the detailing impressive and the surrounding park and rose garden were lovely though it is a bit odd when the occasional street lamp turns out to be a speaker and starts blaring at you in Chinese. But maybe the lamps tell you all the interesting details the signs leave out. Or maybe we should start actually renting the audio guides. Post Temple of Heaven, we took a pretty long stroll up to Qianmen Street for some lunch and with the intention of checking out Tiananmen Square but the square was completely closed off, I think in preparation for the October 1st National Day holiday. Instead we enjoyed the irony of drinking at a Starbuck's across from the gate, explored the touristy stall on shops on the side streets and then found a grocery store to stock up on snacks and spices. I also discovered that the soft serve at McDonald's in Beijing is Jasmine Green Tea and some of the best soft serve I've ever had. Who knew?! Our last day in Beijing we got off to a pretty slow start. After three days of heavy walking and me developing a migraine that was so bad it woke me up multiple times in the night, we were not at our best. We took the morning pretty slow and didn't end up at the Summer Palace until around 2:30. This wasn't a problem for our low key state of mind since were mostly planning on just walking around the lake and the park but if you really want to see everything, it seemed like a full day adventure. Even without going through every building on the park grounds, there's plenty to see (don't forget to look up!) and gorgeous views. My favorite thing was the giant marble (and wood painted to look like marble) boat. In 1881 the Summer Palace went through a major restoration with funds that were supposed to be used for the Chinese Navy but instead were used for a giant ostentatious marble boat which I guess is kind of like the same thing. Climbing up Prosperity Hill we stopped to take a few breaks in covered pavilions that once again had amazing details on the ceilings. At the top of the hill is the Temple of the Sea of Wisdom which is covered in tiny Buddhas and well worth the climb. And if neither the detailed ceilings or Buddhas impress you, than the view certainly will. Had we arrived earlier, I probably would've tried to convince Dan to take a boat ride or rent a paddle boat but instead we contented ourselves with walking about a third of the way around the lake before realizing we had already been in the park for three hours and there was no way we were going to make it all the way around before it was dark and/or we were ready for dinner and started our walk back towards the nearest exit. Our second day, which was our favorite day, was our Great Wall day. It gets a post all to itself.